The Organisation of Islamic Countries (OIC) has denounced calls for the death of the Danish cartoonist who satirised the Prophet Mohammad. OIC Secretary General Ekmeleddin Ihsanoglu said in Pakistan that the calls were un-Islamic and urged Muslims to refrain from violent protests. The cartoons were first published in a Danish newspaper last September. Many people have died in recent protests, including five in Pakistan. 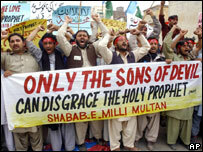 Islamic tradition prohibits any depiction of Allah or the Prophet. On Monday the Iranian foreign minister urged calm. "We should try to cool down the situation," Manouchehr Mottaki said. "We do not support any violence." There have been offers of rewards in Pakistan and India in recent days for anyone killing the cartoonist. The OIC's Ekmeleddin Ihsanoglu told journalists in Islamabad: "This is not a joke to go and say kill this and that. This is a very serious matter and nobody has the authority to issue a ruling to kill people." He said that violent protests, such as burning of vehicles and buildings did not project the true spirit of Islam in the eyes of the West. "Violence weakens us. Violence works against us. Anything except violence is helpful." Mr Ihsanoglu also denounced the calls for boycott of Danish and European products across the Muslim world. He said the OIC was seeking an assurance from the EU that such incidents would not be repeated in the future and called upon the West to ensure that the dignity of Islam was respected. Mr Ihsanoglu expressed regret at the failure of some newspapers and governments to apologise to Muslims and rejected the justification that it was an issue of freedom of expression. "What we are looking for is that you take our sensitivities in your definition [of freedom of expression]. If you fail to do that... it will be a problem of credibility and a problem of universality of European values." 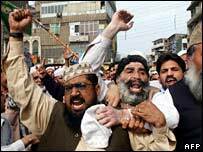 Protests against the controversial cartoons continued in Pakistan with nearly 2,000 people in taking part in a rally near the main town of Wana in South Waziristan. In Rawalpindi traders closed their shops as a mark of protest. Reports say about five of the city's major markets were closed.